Touched by Nature is an organic clothing and accessories brand offering coordinated layette pieces made from super soft 100% organic cotton. 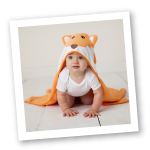 Touched by Nature is an organic baby and toddler clothing brand focused on making organic fabric products that are environmentally sustainable and support a healthier planet. Our luxuriously soft organic cotton clothing makes for the coziest and most comfortable line of baby onesies, pants, union suits, bibs, socks and more. Our 100% organic cotton line is gentle, comfy and better on baby’s sensitive skin as it is made without synthetic pesticides and fertilizers. With natural and breathable fibers, our organic cotton feels wonderful on baby’s skin. Further, our organic cotton clothes and accessories will last longer as the material washes well, holds up wash after wash, and stays true to size for perfect fit. Touched by Nature offers coordinating designs across accessories, bedding, clothing, feeding, footwear and more to make for an adorably stylish, cozy nursery and wardrobe for your baby. We are committed to making baby clothes and accessories with natural and pure 100% organic cotton. Our organic cotton line supports a healthier environment, planet and life for farmers by reducing the use of pesticides and fertilizers. Touched by Nature products are available on all major retailer websites, including Amazon.com, BabiesRus.com, BuyBuyBaby.com, Target.com, Walmart.com, Zulily.com.